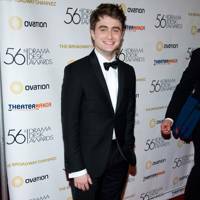 The Harry Potter films have ended but how has the stars' style changed over time? From Neville Longbottom to Ron Weasley, the characters remain fixed in our minds. But as stars Matthew Lewis and Rupert Grint show, things have really changed in the real world. 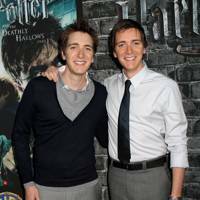 Here's a look at how the Harry Potter cast appeared back then, and what they're up to now. 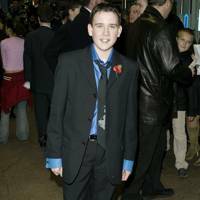 Matthew Lewis, aka Neville Longbottom, was not really one to watch in the fashion stakes when he took to the Harry Potter red carpet as a teen. Fast-forward 10 years and little Neville Longbottom has only gone and scored himself an cover. He's even giving David Beckham a run for his money in he underwear stakes. Even Voldemort would be impressed by those abs! 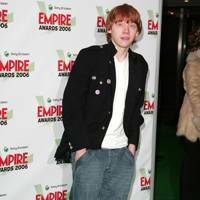 Just HOW BAGGY are Rupert Grint’s clothes in this picture? 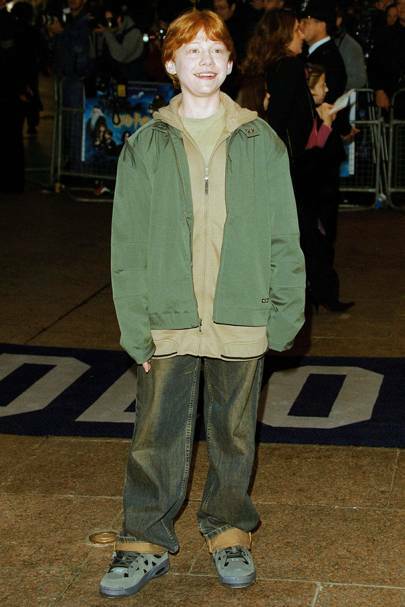 And for his first premiere (in 2001), we thought he could have chosen something a bit smarter than jeans and a hoodie. Five years later and the baggy jeans are still there but Rupert is looking a little more fashion-forward in this military-inspired jacket and white tee. It’s getting better, we’ll give him that. This is more like it! Dressed by Dolce & Gabbana for the BAFTA Awards in 2011, Rupert shows that there is a very stylish man under all those baggy clothes. Back in 2005, boho was in full swing so Cleménce Poésy’s embellished kaftan dress and brushed suede knee-highs were bang-on trend. Looking every inch Chanel-chic, Cleménce Poésy was well on her way to finding her signature (very French) style at a screening for In Bruges in 2008. Transformation complete! Boho was a distant memory as Cleménce vamped up her look with this Chanel Resort black beaded pleated dress and deep red lippy at the 2011 amfAR gala. This photo almost killed our Robert Pattinson crushes dead. Almost, but not quite. 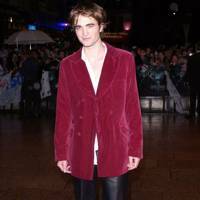 In 2005, the actor, who played Cedric Diggory in Harry Potter And The Goblet Of Fire, thought it was a good idea to wear leather trousers, with a velvet jacket. Hmm – and we’re going to try and ignore those shoes. Not even you, Rob, can carry off this look. Much better! 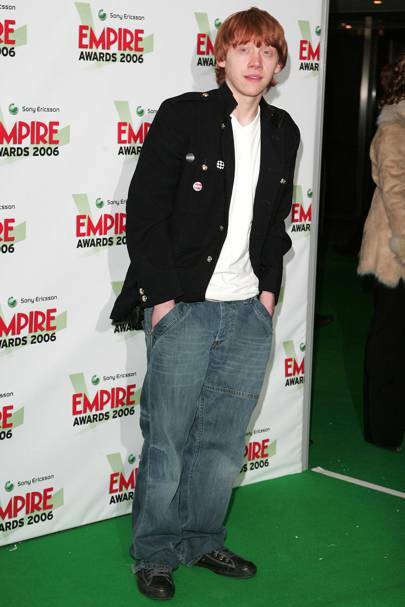 In 2005 Robert swapped the leather and velvet for denim and general hotness. No wonder we were Robsessed as soon as we clapped eyes on him. Just a shame he forgot to tie his shoelaces. Rob has developed his style credentials ever since and, this year, we named him 2011’s Best Dressed Man. 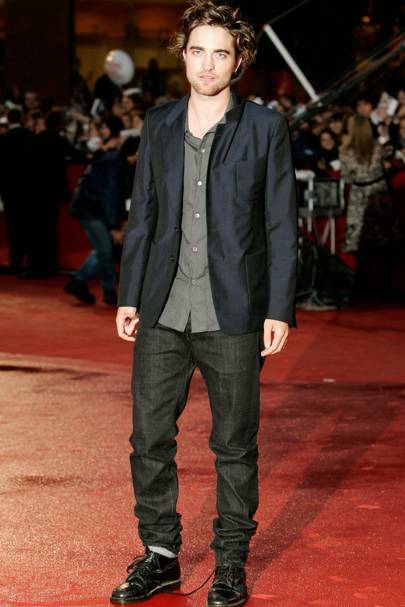 Here, at the Water For Elephants German premiere, Rob wore a chocolate brown Gucci suit and showed he isn’t scared to experiment. As long as that experiment doesn’t involve those leather trouser, we’re happy with that, Rob. How sweet! 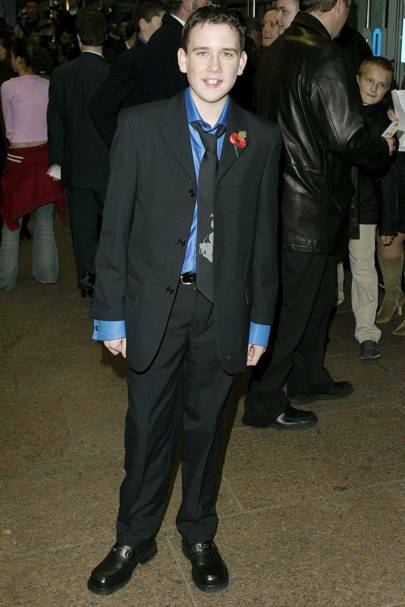 Little Daniel Radcliffe doesn’t do too badly for 12-year-old in this smart-but-casual suit at the first Harry Potter premiere. But then, what happened? 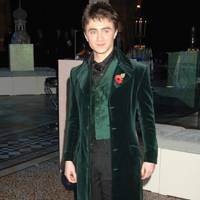 Daniel Radcliffe looked like he was channelling his first role as Nicholas Nickleby in this frightening green velvet two-piece, complete with black cravat, in 2005. Phew, Daniel’s Dickensen fashion was only a phase. 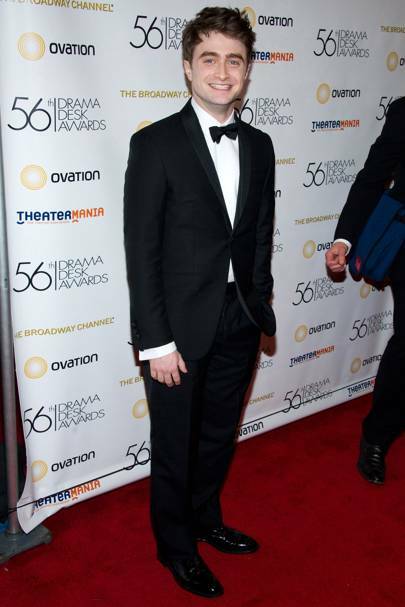 In 2011, he was looking much more dapper in Black Tie and shiny shoes. 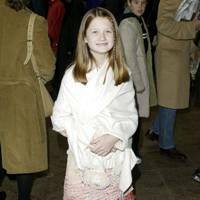 Yes, Bonnie Wright looks very sweet but, aged 11, her personal style was not immediately obvious. Especially as (apart from a pair of cowboy boots), we couldn’t see what she was wearing under that cream pashima! Bonnie Wright’s style evolution wasn’t as rapid as her Harry Potter co-stars as this outfit attests. Her skirt is pretty but why has she mis-matched it with a pale blue blouse and clumpy shoes? She should have been showing off that Miu Miu handbag instead of carrying it like a granny! This was the moment Bonnie made us sit up and take notice. Wearing a Clements Ribiero silk-print gown to the 2011 BAFTAs, she looked stunning. Simple as. 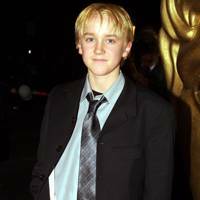 Tom Felton looked more naughty schoolboy than blossoming Hollywood star as he turned up to the British Academy Children’s Film and TV Awards with his shirt untucked and his hands in his pockets. The renegade. 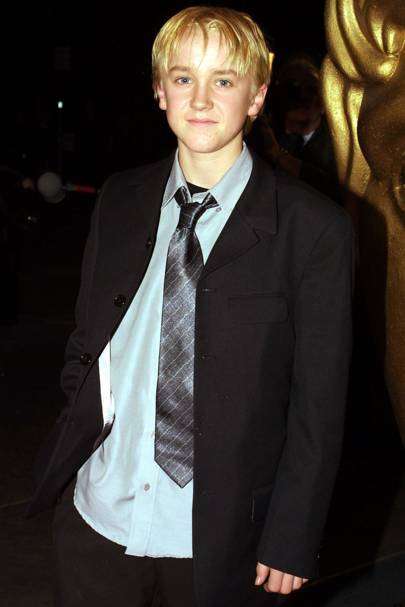 But, by 2004, Tom had smartened up his act and arrived at the Prisoner of Azkaban looking more than a bit of all-white. Very cool. 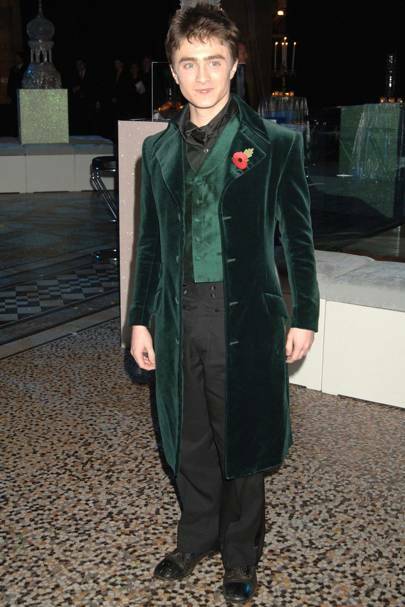 Of all the Harry Potter men, Tom is the one who seems most comfortable playing about with fashion trends. At the MTV Movie Awards in 2011, he rocked a nautical theme in a striped tee and navy jacket and trousers combo. Back in 2005, Katie Leung looked like she was heading off for a day at the office rather than a glitzy Hollywood premiere. Fortunately, by 2010, Katie had ditched the workwear (and discovered lipstick). At the Deathly Hallows: Part 1 premiere, Katie showed her fashion credentials in this high waisted skirt and silk blouse. 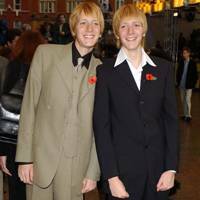 Oliver and James Phelps didn’t look like they particularly liked wearing lounge suits at the Chamber of Secrets premiere in 2002. 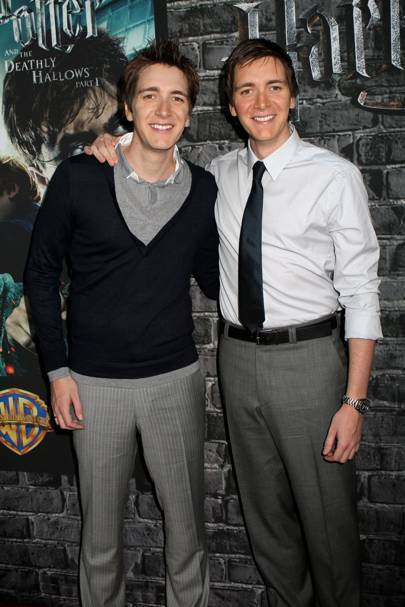 So we weren’t that surprised when they went for a more relaxed look at the Deathly Hallows: Part 1 premiere in 2010. We love the colour of Evanna Lynch’s nautical-inspired gown in 2007; it’s just a shame her hair looks like it’s been in the sea too. Looking soooo much better in 2011. 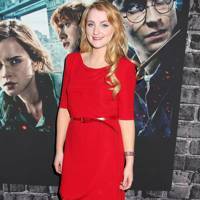 Evanna continues to rock brights (this time a racy red) but her hair has a gentle curl which complements her sophisticated dress. It’s hard to see the fashion icon that Emma Watson was to become with her first American red carpet outfit. 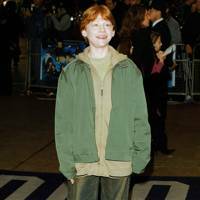 The starlet wore this pantomime-style get-up to the premiere of Harry Potter And The Philosopher’s Stone in NY in 2001. Yes, it’s Emma alright but there’s no fashion magic there. But then Emma Watson discovered Chanel and everything changed! Note the early tentative steps in embellishment (this was to become a bit of a trademark for the star) – and, hooray, she’s got her legs out! 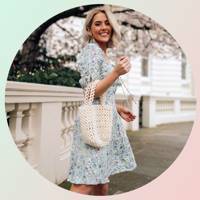 All grown up and a fully-fledged fashionista, with numerous best-dressed awards under her belt, Emma Watson wasn’t afraid to try something a bit risqué on the red carpet – feathers and revealing lace, anyone?